The Bag project puts together the best fashion accessory details in a modular sofa design. The ability to blend the culture and history distinctive of Italian manufacturing excellence is the starting point for a rigorous, masculine living room project. Just like an article of clothing, the sofa is complemented by accessories and functional parts made with multi-materiality in mind: brushed brass, black nickel, heavy-duty leather, soft leather and fabric. Bag expresses a single concept made up of lots of details. The side of the sofa is available in various configurations including an upholstered armrest, heavyduty leather sides or a metal frame. 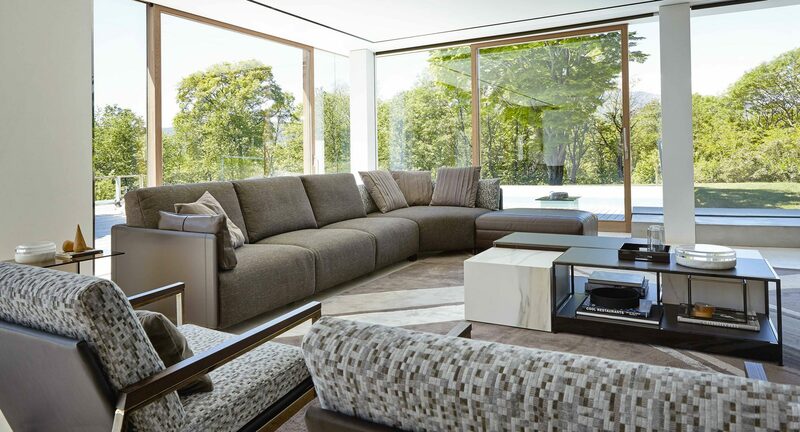 The sofa can have quilted upholstery to which scatter cushions with pleated covers can be added. La confezione del divano può essere realizzata con trapuntatura, a cui si aggiungono dei cuscini volanti con confezione a plisse’.